Editor’s note: This is the third part in our series of posts covering 2018 flooring trends. Miss our earlier posts? Visit our archives to learn what’s new (and what’s coming) in hardwood and tile flooring. Area rugs are a must-have for homeowners who choose hard surface flooring like tile, hardwood, and resilient flooring. That’s because while hard surface flooring materials create stunning living areas, they are not what most people consider comfortable underfoot, which makes carrying a wide selection of high-quality, stylish area rugs more important than ever. If you want to increase attractiveness and comfort in a room with hard surface flooring, consider an area rug. They are transformative! Area rugs provide a comfortable and supportive underfoot feel when you walk around your home barefoot, and they are a fun way to add style and design to any room. As an added benefit, area rugs also help absorb echoes that often accompany hard surface flooring. The right area rug will absorb sound, a crucial benefit when it comes to making rooms with hard surface flooring more cozy. Depending on the style, shape, pattern, color, and texture that you choose, an area rug will make a bold or restrained statement. With a bit of knowledge about size, placement, and more, you can use area rugs to update any room in your house. Don’t limit yourself to just using an area rug in a hallway, near a door, or beneath a dining room table. Explore this guide and find all the ways that area rugs can enhance each room in your home. Area rugs come in so many sizes, it can be hard to know which one is best for your room. The right size for you is going to depend on the overall size of the room, as well as the size of the area you want the rug to cover. It is important to frame the area rug with the floor while providing a stable foundation for chairs and other furniture. Once you have chosen a size, you’ll need to determine what shape will work best. Rectangular rugs are great, but don’t overlook other shape choices, such as: squares, circles, ovals, or even custom-designed shapes. Looking for more area rug inspiration? 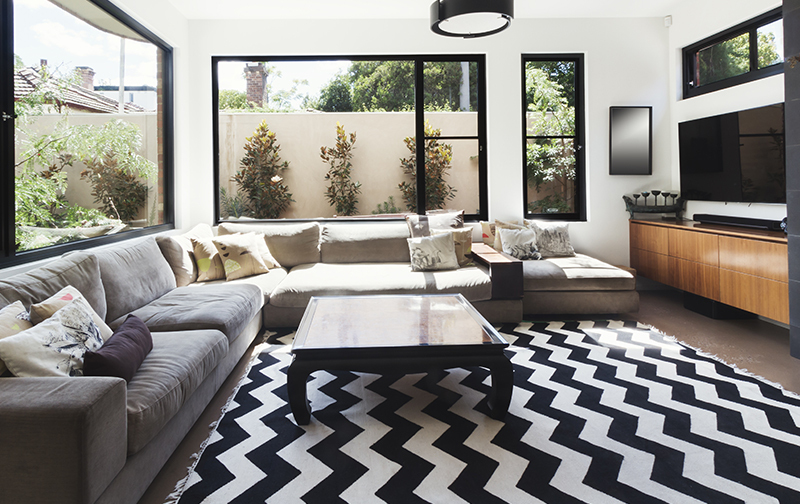 Check out the Kermans page on Houzz to see ideas and bold ways to use area rugs. What about custom area rugs? Looking for a custom solution? Kermans can cut an area rug out of nearly any carpet style and create a new covering made to fit your space perfectly. The pricing for custom area rugs is surprisingly competitive. If you have a room that is difficult to figure out, creating a custom area rug is a perfect solution. Rug placement can be a tricky issue. How do you place an area rug in your living room sitting area? Bedroom? Dining room? What’s the difference in how your use a runner versus an accent rug? Each room and each situation has its own design challenges, and the Kermans area rug placement guide can give you the know-how you need to make the best decisions for placing area rugs in your home. Area rugs are popular for many reasons. Don't be afraid to add this versatile floor covering to your home. Stop by our Indianapolis showroom and spend some time looking at our area rugs selection. You'll find options in a variety of shapes, sizes, colors and prices.